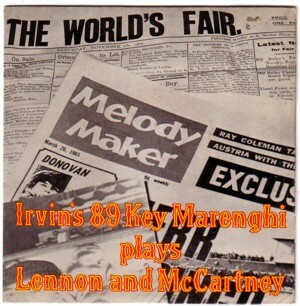 I wanted to play a song from an EP by The Irvin’s 89 Key Marenghi Fair Organ today. It has five versions of Beatles hits on it. But since I can only show the not very spectacular cover, and recite the liner notes ( ? ?”…inviting grandeur with the vitality of the present…? ?” ), I thought it would be a better idea to ask my son to search the Internet for some nice Beatles illustrations. Well, here is the result. I have no idea where all this artwork comes from and who is responsible for it.